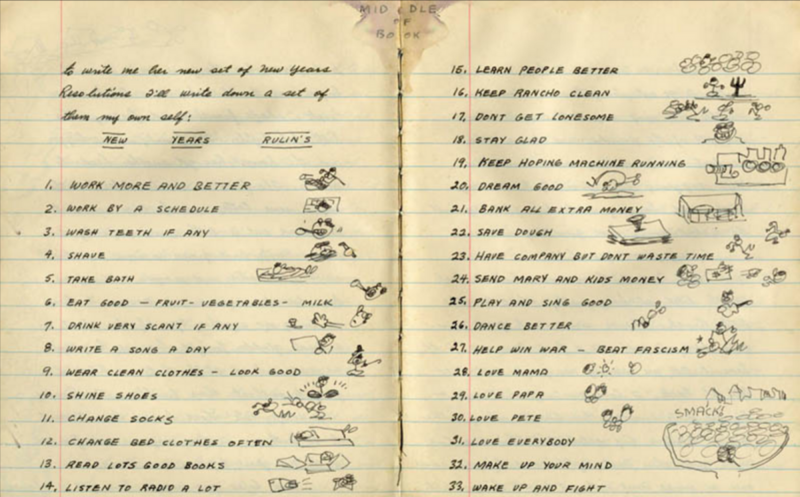 I’ve been happy to see Woody Guthrie’s list of “New Years Rulin’s” being shared widely online—not just because it’s quite a worthy list, but because over the summer I set the whole thing to music, as the conclu­sion of a new piece called Work Songs. The set is written for three singers: Becca Stevens, Gabriel Kahane, and Ted Hearne (who leads “Rulins” with some savage high C’s)—all playing instru­ments, and backed up by Nathan Koci on accor­dion and me on piano. It’ll be premièred in March at the Ecstatic Music Festival in New York and Liquid Music in St. Paul.